If you want to run a mile, then run a mile. If you want to experience another life, run a marathon. In reality, the way I’d answer that question is that I run marathons because, quite simply, marathons are my thing. 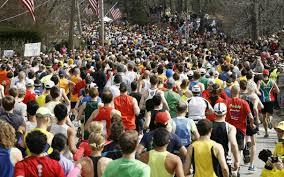 I’m not alone- over 487,000 Americans ran marathons in 2012. Marathons around the world are filling up in record time. My suspicion is that many of the people who ask me about marathons actually might secretly want to run one too. However, they may feel like I did before I ran my first marathon- I can’t run a marathon. That’s way too hard. Too much training. I’m not a real runner. Add about 50 other reasons, and you have an idea of why it took me many years to actually sign up and go for it. As it turns out, running a marathon is an item found on many a bucket list. Yet, like many bucket list wishes, unless we take action to make them happen, the wishes remain in the land of “someday.” If you picked up this book, I’m guessing that running a marathon might be one of yours. It was a dream of mine for many years until I finally just went for it. Looking back at my first marathon in 2003, I certainly didn’t do it then because the timing was perfect, and conditions in my life were ideal. No, I happened upon my first marathon somewhat by accident, and thought that the amazing end result would be a sense of satisfaction and better fitting jeans. I never imagined this whole marathon business would change my life. Marathons help you discover what is important to you. And don’t we all want to do that? Running helped me figure out my “one thing.” Completing my first marathon was a game changer. Since then, it’s been my goal to encourage as many people as possible to go for it… meaning run their first marathon or check off any other “impossible” items from their bucket lists. In Why Not 26.2? you’ll find facts about marathons that will hopefully make the idea of a marathon seem more doable. In addition, I’ve thrown in articles from my blog, that will hopefully throw in a bit of food for thought on life in general. Bottom line, it‘s my goal to inspire, motivate, and encourage you, and most importantly let you know that yes… you CAN do 26.2! Well, fear not. Why Not 26.2? offers you 26.2 (well, okay 28, but 26.2 sounds better) facts about running a marathon. They are simple facts, because I want the idea of running a marathon to gain more street cred in your mind. I want you to see and feel like, this is something you could do. Are you on board? If so, lace up your running shoes, because you are in for the run of your life. more coming soon… check back!